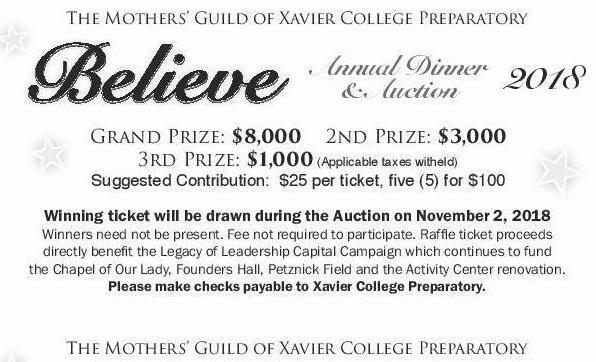 “BELIEVE” DINNER AND AUCTION IS SOON! Here is how you can get be part of this fun event! SALES END ON OCTOBER 22ND! of CA Designs and Julia Winter of Jewel Ya. The Student Raffle has begun! AS SPECIAL INCENTIVE THIS YEAR, IF YOUR DAUGHTER SELLS $1000 IN RAFFLE TICKETS, A RESERVED PARKING SPOT IS HERS FOR THE REMAINDER OF THE 2018-19 SCHOOL YEAR. SPACES ARE LIMITED. student raffle prizes. The deadline is Friday, October 26th. All payments and unsold tickets are due on that day.